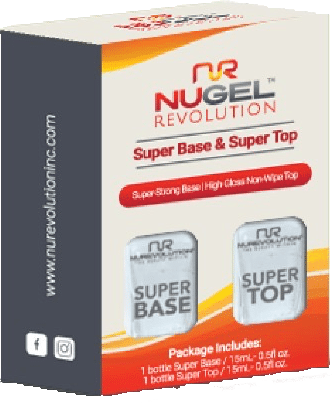 The NuRevolution Super Base builds the adhesive bond between the nail plate and gel products while unharmed the nail plate. The Super Base works as a base for NuRevolution Soak-Off Gel Polish and Vegan Lacquers. Cures: 30 seconds in LED or 60 seconds in UV Light. The NuRevolution Super Top seals your NuRevolution Soak-Off Gel Polish to a super shine finish that wouldn’t peel, chip or dull dull. Super easy to remove and unharmed to your skin. Cures: 60 seconds in LED or 2 minutes in UV Light . 1 Super Base/15 mL – 0.5 fl oz. 1 Super Top/15 mL – 0.5 fl oz.